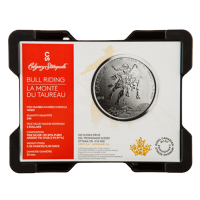 תיבת מפלצת ריקה עבור מטבעות כסף של ה-Royal Canadian Mint במשקל של חצי אונקיה These boxes originally held 240 1/2 oz Royal Canadian Mint silver coins, 12 tubes of 20. These official boxes are direct from the mint and come complete with lids. Organize your stack and make it easy to store. Sticker on the box may vary. Perfect for storing your investment!